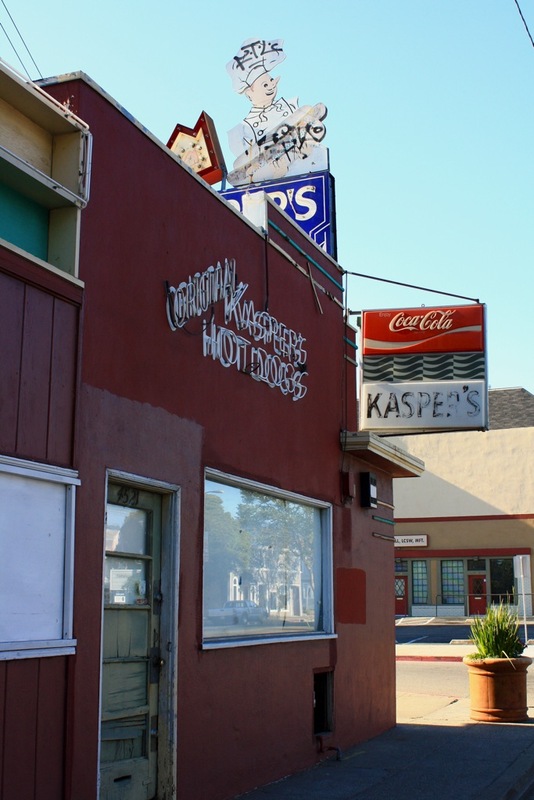 Kasper's was an Oakland institution until it closed in 2003. 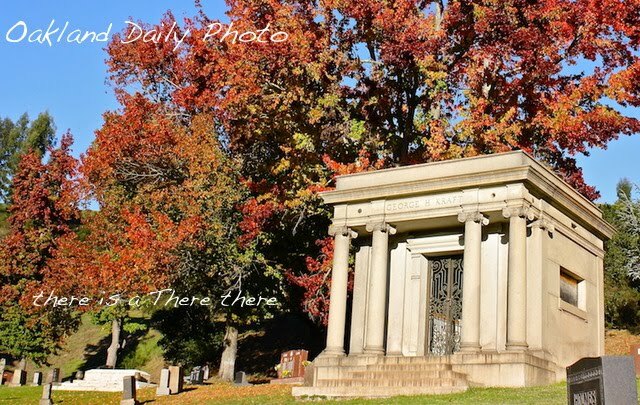 It opened in 1929 and was owned by three generations of sons until its closing. 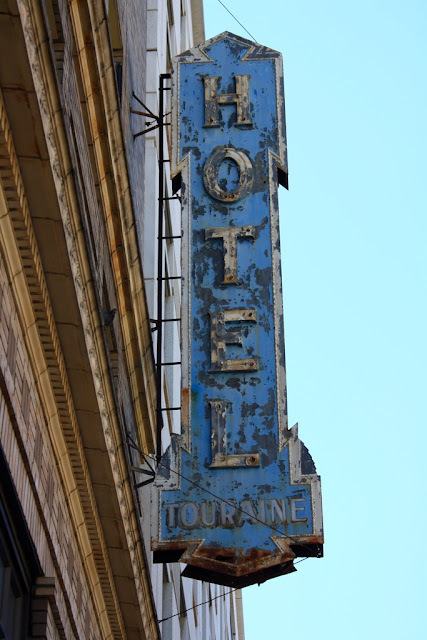 This building and iconic neon sign continue to occupy a triangle corner at Temescal's Telegraph and Shattuck Avenues. While photographing this sign, I met a neighborhood denizen who fondly remembered getting dogs here and still laments its closing. For more "K" photos, be sure to visit ABC Wednesday. This is an automatic post. I'm traveling and will likely have restricted access to computers to comment on your blogs. Back in town on October 1. 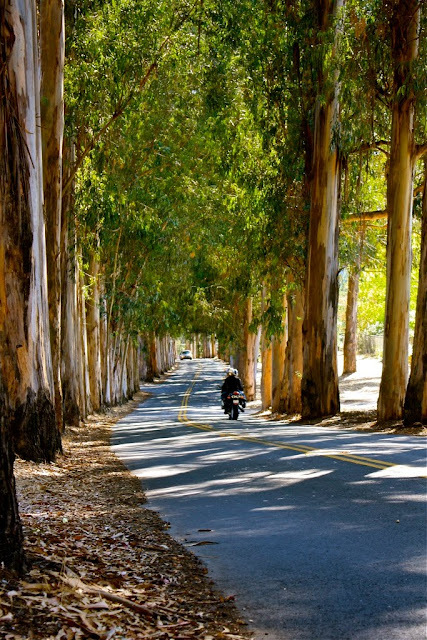 This eucalyptus allée is above the zoo on a road that leads to Skyline Boulevard. It was at the end of this road I found the cowboy working his horses. This rural area is only a few minutes from a major freeway. 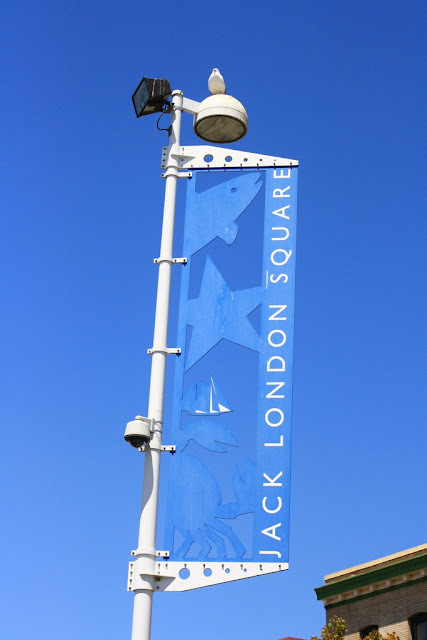 Jack London Square is at the foot of Broadway. Not only does it contain memorabilia of Jack London, you also can catch the ferry to San Francisco from here. Recently a number of new and popular restaurants have opened in the waterfront complex. It is often the site of special events and concerts. And the view of the water and boats is exceptional. For more "J" photos, visit ABC Wednesday. This was taken at MLK Shoreline Park in East Oakland. This bridge crosses a slough that branches off the estuary. Nesting herons can be found nearby. Do you think this child needs safety instructions about about how to safely cross a bridge? For more shots of bridges, visit «Louis'» Sunday Bridge meme. 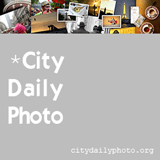 This is an automated post. I'll be traveling and probably won't have much access to computers to comment on your blogs. See you October 1. Ice skating in Oakland? Go figure! The Oakland Ice Center opened in 1995 amid a fair amount of controversy about the economic wisdom of the city funding this project. The hope was that the rink would help change the sketchy feel of the neighborhood. Can't say that it was a complete success either environmentally or economically. The ice center is now managed by the NHL Sharks corporation and offers two rinks, one for skating and one for league hockey. The rates remain reasonable and the Yelp reviews are positive. I've never been inside but I like the murals that decorate the building. I've also seen plenty of 20-somethings walking in with their gear and hockey sticks. They must be Canadians. For more "I" photos from around the world, visit ABC Wednesday. Downtown Oakland has had an explosion of housing construction in the last several years which has brought a positive change to the character of the area. But along with new condos, restaurants, and art galleries, there remain quite a few shabby residential hotels. Here's a vestige from the past that seems to tell a tale. I had a lengthy conversation with a woman who lives in a nearby hotel about what the neighborhood is like. She was down right enthusiastic about the changes she's seen in the last 10 years. She talked about the safety measures that her hotel put in place, the added comforts the rooms now have, and how she can go out after dark without fear. Caution maybe, but not fear. Downtown still has a ways to go, but the changes seem to be helping everyone, not just the privileged. The Hansen Coffee Company continues to roast coffee daily near Jack London Square. In business since 1894, the area the factory is in was formally a heavily industrial neighborhood. Now it is primarily devoted to retail businesses, many of which are struggling to keep their heads above water. For more "H" photos, vist ABC Wednesday. This is one of four projects done in 1992 by artist Sayed Alavi in collaboration with local high school students. It's always a little surprising to find these works when you drive under the freeway. To me the thought provoking blend of the two words juxtaposed with daily traffic becomes an exercise in mindfulness. This is a long view of the Park Street bridge that I've previously shown you here, here, and here. this is one of a number of drawbridges on the estuary that runs into the bay. The green frog on the far right advertises a restaurant that offers a happy hour mai tai at a cheap price. For more bridge photos, visit «Louis'» meme, the Sunday Bridge Series. It's that time of year when goats appear on hillsides and munch on dry grass to reduce the fire hazard. There were at least 100 goats in this herd grazing on zoo property above the 580 freeway. They seem to be taking an afternoon break in the shade due to a brief heat wave. For other "G" photos from around the globe, visit ABC Wednesday.